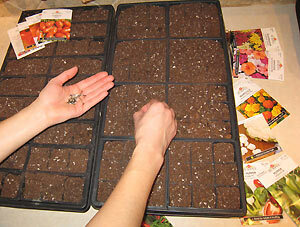 Today we started our indoor seeds. Two weeks behind last year, but the snow really put a damper on our gardening spirits. We planted: canning/cutting tomatoes, Roma tomatoes (for sauces), yellow pear tomatoes, hot pepper mix, jalapenos, sweet peppers, cauliflower, marigolds, impatiens, and snapdragons. My sister provided us with two light fixtures and I filled them with grow-light bulbs in preparation of the new sprouts. Can’t wait to give it a try!